Citation: C N Trueman "Hadrian’s Wall"
Hadrian’s Wall was built on the orders of the Emperor Hadrian. The primary function of Hadrian’s Wall was to keep out the Picts. The Roman Army had advanced into north England but attacks by the Picts made life difficult for them. Hadrian’s Wall was started in AD 122 and it remains a remarkable piece of engineering in the environment it was built in. Hadrian’s Wall is 117 kilometers long and is built in stone. In places it is six meters high and three meters wide – enough for two soldiers to do sentry duty side-by-side. Every Roman mile (about 1500 meters) a mile-castle was built which housed twenty soldiers. Turrets guarded by soldiers were built every 500 meters. Major forts such as the one at Housesteads, were built along the wall at every eight kilometers. These could accommodate between 500 and 1000 Roman soldiers. 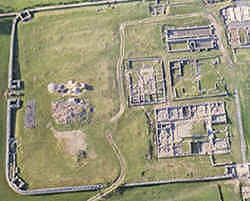 Housesteads had a hospital, granary, barracks, workshop and washroom/toilets built. Stored grain was kept dry by the use of a hypocaust – this way, soldiers always a reasonable supply of food. A Roman road called the Stanegate was built to supply the soldiers based at Hadrian’s Wall. All the building was done by the Roman soldiers themselves. They were trained to do this and the army had its own skilled engineers who designed the wall. That so much of the Wall has survived is a testament to their building skills. The Picts nearly destroyed the wall three times but on every occasion it was rebuilt by the Romans. For nearly 250 years, Hadrian’s Wall was patrolled and guarded – right on the very edge of the Roman Empire.